Jeffrey Kaye, MD, Layton Professor of Neurology and Biomedical Engineering at Oregon Health and Science University, gave the keynote presentation at 24th Annual Alzheimer Day. 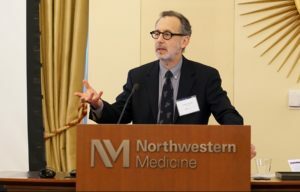 At the 24th Alzheimer Day event, Northwestern announced it had raised $10 million to support and rename the Mesulam Cognitive Neurology and Alzheimer’s Disease Center, named for M. Marsel Mesulam, MD, chief of Behavioral Neurology, the Ruth Dunbar Davee Professor of Neuroscience and director of the CNADC. The capital campaign, which began in 2015, will help the Mesulam Cognitive Neurology and Alzheimer’s Disease Center (Mesulam CNADC) double its workspace and create an endowment for research and education, in addition to the renaming. Naming the center after Mesulam was central to the fundraising campaign, according to Alan Krensky, MD, vice dean for Development and Alumni Relations. Ellen Fitzmorris Clarke, first-year student in the Physician Assistant Program, answers questions about her scientific poster. This year’s symposium also aimed to educate health professionals and community members on Alzheimer’s disease research at Northwestern. The gift announcement was followed by a presentation from Jeffrey Kaye, MD, Layton Professor of Neurology and Biomedical Engineering at Oregon Health and Science University, highlighting the use of “pervasive computing” in tracking cognitive decline in the home. Instead, patients with or at risk of cognitive decline could be constantly measured on rates of activity and sleep, achieved through wearable devices or passive sensors throughout the house. 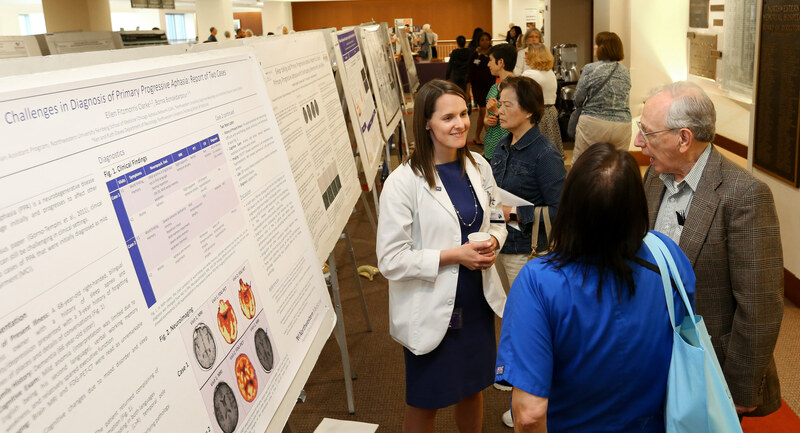 Later in the day, the scientific poster session showcased 51 posters — an Alzheimer Day record — from various members of the Northwestern community. The topics included basic science, clinical care and behavioral interventions. However, not all posters focused on Alzheimer’s disease. Some scientists, including Missia Kohler, MD, neuropathology fellow, were investigating related neurodegenerative diseases, such as primary progressive aphasia (PPA). 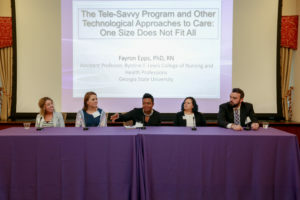 Becky Khayum, MS, adjunct instructor of Physical Therapy and Human Movement Sciences, Emily Rogalski, ’07 PhD, associate professor of Psychiatry and Behavioral Sciences, Fayron Epps, PhD, RN, assistant professor at Georgia State University, Marcia Festen and Ian Grant, MD, instructor of Neurology in the Ken and Ruth Davee Department of Neurology, answer audience questions during the panel. John Disterhoft, PhD, the Ernest J. and Hattie H. Magerstadt Memorial Research Professor of Physiology, presented the Marie & Carl Duncan Prize in Memory Research to Melvin Thompson, MBA, executive director of the Endeleo Institute, and Darby Morhardt, PhD, research associate professor in the CNADC and of Preventive Medicine. Thompson and Morhardt were selected for their poster titled “Reach to Faith 2.0,” detailing their efforts to build a dementia-friendly library on the South Side of Chicago. 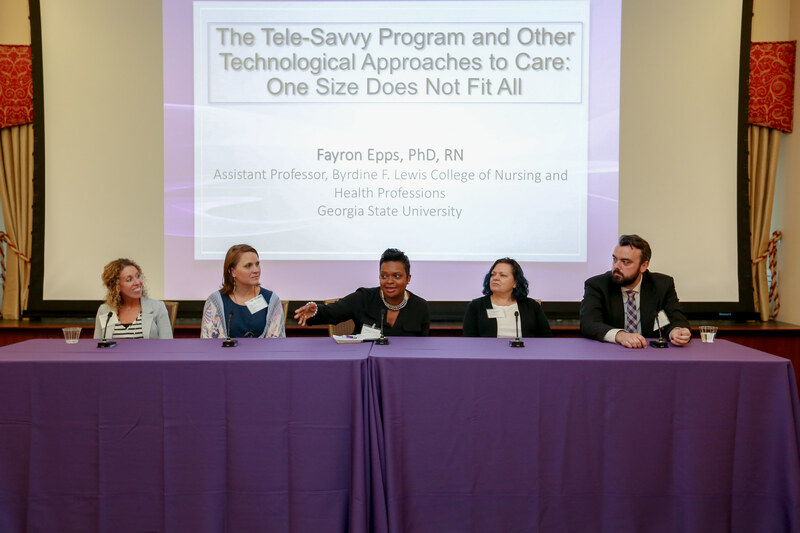 Afternoon session speakers included Fayron Epps, PhD, RN, assistant professor at Georgia State University, who spoke about a caregiver training service conducted over video chat called Tele-Savvy; Becky Khayum, MS, adjunct instructor of Physical Therapy and Human Movement Sciences, who presented several home communication interventions caregivers could use to help their cognitively-impaired family members or patients; and Emily Rogalski, ’07 PhD, associate professor of Psychiatry and Behavioral Sciences, who spoke about choosing the right level of technology to implement into Alzheimer’s disease care. The day was capped off with a panel discussion and question-and-answer session moderated by Lauren Dowden, MSW, LCSW, social worker at the CNADC and featuring Khayum, Epps, Rogalski, Marcia Festen, a Chicago-area caregiver, and Ian Grant, MD, instructor of Neurology in the Ken and Ruth Davee Department of Neurology.